Many people believe that, just by stepping inside and closing the door, the air they are breathing automatically becomes more clean and pure. In truth, the exact opposite is much more likely to be the case. Some people suffer for many years with health symptoms that are being triggered by the air in their own home, but they don't realize it. In this post, learn about the most common types of indoor air contaminants and the kinds of health symptoms they can cause. 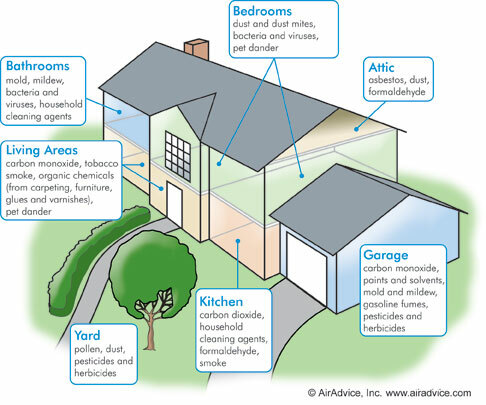 This helpful graphic shows where in the home each contaminant is most likely to gather. The following list can help you match any health symptoms you may be experiencing with possible indoor air contaminants that may be circulating in your home. Mildew and mold are perhaps the most highly publicized air contaminants that affect homes and workplaces today. "Mildew" is actually another word for a certain type of mold. Bathrooms, laundry rooms and other areas where there is higher humidity are ripe breeding grounds for mold and mildew. Symptoms: Skin redness and rash, itching and watering of the eyes, wheezing and sneezing, headache and breathing issues are all common signs of exposure. The most common sign of too much carbon dioxide in the air is a feeling that you are breathing "stale air." Carbon dioxide builds up when ventilation systems aren't working well enough to cleanse and refresh the air supply. Symptoms: Signs that the air has too much carbon dioxide in it include an elevated heart rate, a more rapid breathing, persistent headache, vision and hearing difficulties, dizziness, and weariness. Carbon monoxide is a deadly gas that can be leaked from household appliances, vehicles, and outdoor grills and propane tanks. Symptoms: Symptoms of poisoning by exposure to carbon monoxide include feelings of weakness, nausea, vomiting, headache, dizziness, blurry vision, mental confusion, and even a loss of consciousness. Dust not only builds up when air circulates through your home, but dust mites that live in your mattresses, blankets and pillows can cause their own unpleasant allergic reactions. Symptoms: Postnasal drip is a surefire sign that dust has gotten into your airways, as is a feeling of pressure/pain in the face and sinuses. Coughing and congestion, a nose that is very itchy at the tip, sneezing, itchy eyes, and swollen bags under your eyes are other telltale signs. Even if you use the mildest natural cleaners, there will likely still be some fumes emitted. The harsher chemicals such as bleach can have a very strong odor indeed, and some household products are so strong they are actually dangerous for children and pets. Symptoms: One of the most common symptoms of exposure to chemical fumes is called "chemical pneumonia." Symptoms can be produced in varying degrees, including sore throat, inflammation of lung tissue, burning/watery eyes and throat, breathing troubles, persistent cough, headache or dizziness, trouble concentrating, fever, and body aches. Even if you don't use pesticides or herbicides on your own lawn or garden, there is no guarantee that the products your neighbors use won't make their way into your indoor air supply. Symptoms: Symptoms of a reaction to pesticides or herbicides can be varied, but tend to manifest either on the skin, or in the respiratory system. Wheezing, asthma developing or worsening, hives or skin itching, rashes, sneezing, sore throat, and other symptoms can all indicate exposure. The most common virus is the common cold, and of course you are likely already familiar with flu season. As well, bacteria can cause infections on any area of the body. Contact with other people or animals, or contact with infected surfaces can bring these contaminants into your home. Symptoms: Symptoms of both bacterial and viral infections can be quite similar. Wheezing and sneezing, vomiting and diarrhea, fever and chills, are some of the most common symptoms. If you have indoor flowering or fruiting greenery, you may have pollen that is being produced inside your home and getting circulated through the HVAC system. But the most common way that pollen gets into your home is when doors are left open and the wind carries it in or when you track it in on your clothing or shoes. Pollen tends to be worse at certain times of year, such as in spring when everything starts blooming. Symptoms: Symptoms of a pollen allergy include sneezing, congestion, a sore throat, watery or itching eyes, skin irritation, hives, fatigue, coughing, and even a stomach ache. If you have a non-human family member or two living with you, then you are likely being exposed to pet dander. Different pets can produce different contaminants, including fur, proteins from skin/waste/saliva, dander, and mites. Symptoms: Symptoms of a possible pet allergy include sneezing, watery or itchy eyes, runny nose and sniffling, skin itching. Indoor air quality is a critical part of maintaining health and vitality. Scheduling periodic indoor air quality testing can help identify contaminants before the health side effects seriously impact your family's health and wellbeing. The first step is to identify the contaminants that may be present in your indoor air circulation. The next step is to create lasting solutions so you can return to breathing clean, safe air once again. Contact Clean Air Solutions for a free quote.